Long before PNC Park, Three Rivers Stadium, and Forbes Field, Pittsburgh’s professional baseball teams played at a place known as Exposition Park. In truth, there actually were three different incarnations of Exposition Park located along the banks of the Allegheny River. The third, and most well documented, being the last of the three. In the above photograph, North Side’s Monument Hill is visible in the background (now Community College of Allegheny County). As is evident in the above postcard, Exposition Park once sat along the Allegheny River, across from downtown Pittsburgh, just west of the Pirates current home, PNC Park. The picture below of the Bill Mazeroski Statute located outside the Right Field Gate, includes some of the same buildings across the Allegheny River that appear in the postcard above, most notably the Marriott Renaissance Hotel, with its distinctive upside down u-shaped breezeway, to the left in the photograph. Because the area along the Allegheny River where the ballpark once stood flooded several times, and has been dredged and widened, the exact location of Exposition Park is difficult to determine. However, along the banks of the river, just east of Interstate 279 and the Fort Duquesne Bridge, a plaque constructed by the Pennsylvania State Historical and Museum Society honors Exposition Park. The plaque also notes that in October 1903, the very first World Series – between the Pittsburgh Pirates and Boston Americans – was played there. The former site of two other Pittsburgh ballparks reside in the area near Exposition Park. Three Rivers Stadium sat just to the north and west of Exposition Park. The picture below, taken just north of Exposition Park’s former site facing in the direction Heinz Field, shows the approximate location of Three Rivers Stadium, which is now, largely, a parking lot. The Pennsylvania State historical marker likewise notes that the first professional football game was played at Recreation Park in 1892, one year after the Pirates left for Exposition Park. The Pirates current home, PNC Park, resides just a long fly ball from the former site of Exposition Park. 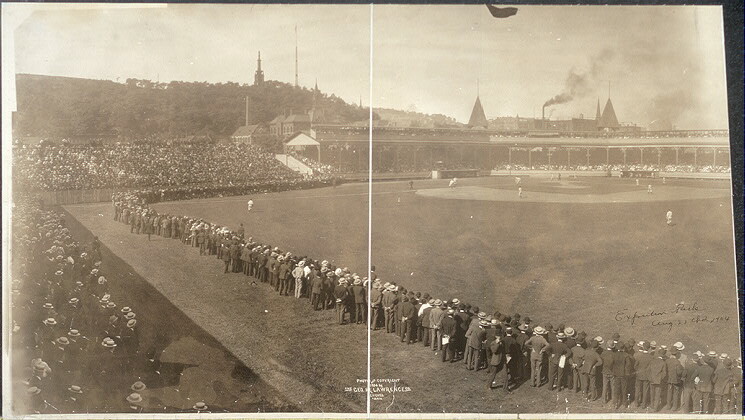 In addition to the Pirates, who played at Exposition Park from 1891 to 1909, before moving to Forbes Field mid season, the Players League Pittsburgh Burghers played at Exposition Park in 1890 and the Federal League Pittsburgh Stogies and Pittsburgh Rebels played at Exposition Park from 1913 to 1915. With so many lost ballparks located near the Pirates current home, anyone who cares at all about the history of the game should be sure to take a stroll just west of PNC Park and visit the former sites not only of Exposition Park, but Recreation Park and Three Rivers Stadium as well. This is a great web site for old baseball aficionado’s. Keep up the good work and enjoy your many travels.